"Welcome, Laserbeak. Unlike some of my other warriors, you never fail me." Io9 Recently wrote a piece on the greatest spies in pop-culture. But, there was one massive omission to the list, a mistake that they will dread in the coming conquering of Earth. Laserbeak, the Decepticons chief spy was nowhere to be seen despite obviously being the greatest spy in all of fiction. For those asking. "Wait, that weird looking bird thing from the third film?" No this isn't about that version. This is about the original G1 version of him, the version that could transform from a mini cassette to a condor and was one of the minions of the fearful and glorious Soundwave. 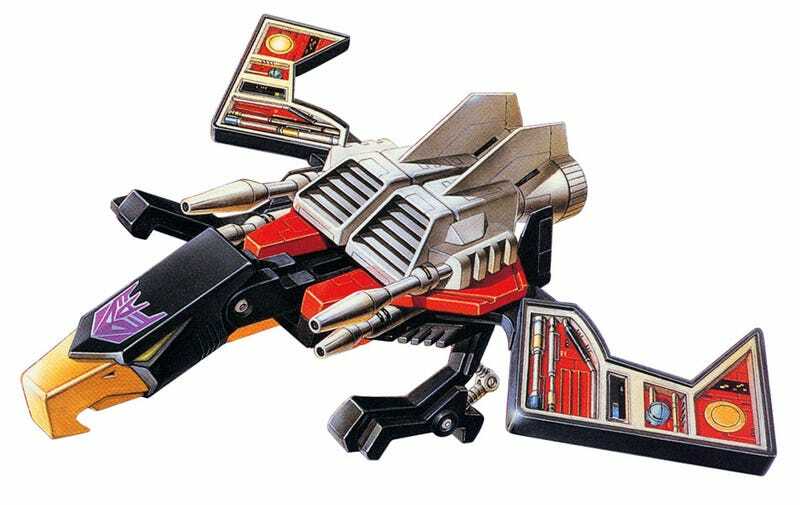 Something people seem to forget about Laserbeak from the original cartoon was that he was amazingly fast. Seemingly able to fly anywhere on earth, find a good hiding spot and begin spying in a matter of minutes. Now tell me, are any of your fleshy, weak willed human spies capable of that. No? I didn't think so. However, what out shines even that is he is still capable of doing this, even in space. Yes. in the 1986 original movie (which completely misinterpreted the actual events to make the Autobots look good), Laserbeak could launch from Cybertron, fly to Moon Base 1 and find the command centre, in less than a minute! Martini, Shaken not Stirred? Lame! This leads us into the fact that if you think about it, Laserbeak has one of the highest success rates of any individual spy in fiction. And of course, let us not forget the time he was able to take out Optimus Prime. In the episode Divide and Conquer, Laserbeak is able to successfully infiltrate the Autobot base again (while literally sitting on top of the shoulder of Brawn) and blows up Optimus's insides when Ratchet was doing an examination of his body. This would have killed him too, if it wasn't for Shockwave's incompetence for allowing the Autobots to return from Cybertron after collecting the needed materials to revive him (and he wonders why we gave him a glorified Janitor's position). Laserbeak doesn't need a Q unit to give him his gadgets as his body has all the equipment he will ever need. He already has the perfect disguise, he is capable of flight and he has two ion laser cannons on his back (which are able to detach while still being able to fire & fly independently). He has an inbuilt camera and microphone as well as having instant Wi-Fi. His outer shell is impenetrable to nearly all human weaponry and can scan perfect holograms of his victims whenever he wants. In short, he is perfect thanks to the power of die-cast construction baby, it's a lost art. We Decepticons are fully aware that we are perceived as the bad guys within the Galaxy (damm that Autobot propaganda) and as such, many of us like to play into the evil stereotype once in a while for kicks. Unfortunately, this has sometimes led to disaster when we Decepticons fall for the Evil Gloating trope. Basically telling the good guys the evil plan then gloating they have no way of stopping it which of course, they do. Even I have fell for this from time to time, but not Laserbeak. Now of course you may be saying of course he couldn't evil gloat, he couldn't speak! That didn't stop Ravage from doing it in Beast Wars and look at what happened to him! Now lastly, Laserbeak is probably the best spy because unlike nearly every other spy, he knew when to quit. He knew it was better to retire on top rather than keep on going and either die horribly, lose pathetically or die in a last stand situation. If you don't know what I'm talking about, in the episode Webworld, Laserbeak, Motormaster and Swindle make an ultimatum to Cyclonus that if there was no improvement on Galvatron's insanity, they were quitting. Though Galvatron did improve, Laserbeak still quit, realizing that the Decepticons were failing and there was no hope. We of course had a disagreement about this but I let him go because I trusted he could make his own decisions. But then I discovered that he was working with Takara on that Armada series as an Autobot and we had a really big falling out. What's worse is that he started working with these other Soundwave's like that Doctor Claw sounding guy in the movies or that guy who I swear sounds like Gary Chalk from Cybertron. All just to spite me and as you can guess, we haven't talked since then. I haven't exactly had the best time of it since the 80s. My alt mode is now horribly out of date and these new strange Androids and IPhones are just to breakable. My last acting gig was in 1999 where I embarrassingly played a background role in Beast Machines where I was killed by a Vehicon drone (I bet most reading this don't even know what a Vehicon is). Buzzsaw has tried his best to make me happy, but he was always just a shadow compared to you. I've realized over the years I over-reacted then, I let my old prejudices get the better of me. I don't care if you're an Autobot or a Decepticon, I just want my old friend back. P.S. Still missing you old buddy every day. If you ever need a place to stay or if you just want to talk, you know where I am.